August 2010 sales are 997,574, down 21 percent from 2009. August's SAAR is 10.8 million. 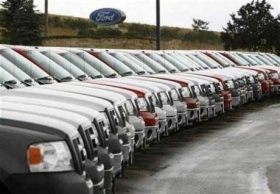 Any way you look at it, August U.S. auto sales disappointed. Compared with “clunker August” a year ago, sales fell 21 percent. Compared with the month before, volume dropped 5 percent. Even seasonally-adjusted, it was the worst month since February. U.S. sales totaled 997,574 sales in August, down from 1,050,110 in July. A year ago, driven by federal cash incentives of $3,500 to $4,500, August sales hit 1.26 million. The seasonally adjusted annual selling rate calculated by the Automotive News Data Center was 10.8 million, the first month since January and February to fall below 11.1 million. Most analysts had forecast more than a million units and a SAAR comparable to July's 11.6 million. But some analysts noted during late August that dealer volume was flagging. The cash-for-clunkers spike in July and August 2009 makes direct year-over-year comparisons difficult. U.S. government cash incentives of $3,500 or $4,500 on older vehicles drove August 2009 auto sales to 1.26 million units. The Automotive News Data Center SAAR jumped to 13.7 million, the highest monthly selling rate in a year that finished with 10.4 million sales. August 2009 sales were 1,262,189 units, which was up a mere 1 percent from August, 2008. August 2008 sales of 1,249,976 units were down 15 percent from August 2007. Automakers boosted August per-vehicle incentives from a year ago during cash for clunkers, but made few changes from July offers. The U.S. government's $3,500 and $4,500 incentives on clunker trade-ins let automakers throttle back on incentives in July and August 2009. So it's not surprising that this August, when Uncle Sam is not shoveling money at auto sales, manufacturers have to work a little harder. Average spending rose $485 to $2,864 per vehicle, says TrueCar.com. Edmunds.com has the industry up $225 to $2,681. But compared with July, the rival Web sites disagree. Edmunds.com says August industry spiffs are down $84 or 3 percent. TrueCar.com says incentives rose a half percent, about $14. Why the difference? TrueCar.com top analyst Jesse Toprak, who used to work for Edmunds.com, says TrueCar.com also calculates factory bonuses for reaching sales quotas, and that type of spending is on the rise. Chrysler Group was the only major player to post a year-over-year sales increase in August, up 7 percent to 99,611 light vehicles. The other Big Seven auto groups fell by double-digit percentages from a year earlier. On the low end of the losses from last August, Ford Motor Co. fell14 percent, while Toyota Motor Sales U.S.A. fared worst, with a plunge of 34 percent. Compared with July this year, all seven manufacturers lost ground, but by small amounts. Honda finished 3 percent lower than July and Hyundai-Kia Automotive was down 4 percent. Chrysler, General Motors Co., Nissan North America and Ford were clustered with month-to-month declines of between 6 and 8 percent. Toyota was again the hardest hit, down 12 percent. Among the smaller auto groups, luxury specialists Daimler AG, Porsche North America and Jaguar Land Rover managed to boost August sales above the year earlier period. Daimler gained 7 percent, while Jaguar was up a quarter and Porsche a third. But clunker incentives drove sales of smaller, more fuel-efficient vehicles, so most luxury brands didn't get a lift from the program. Volkswagen of America fell 3 percent from last August, and BMW Group 2 percent. Small-car brands Mazda, Subaru , Mitsubishi and Suzuki fell further than the industry's 21 percent decline. Sales of vehicles built in North America continue to do well – at least in terms of winning U.S. market share. Through the first eight months, manufacturers sold 5.87 million light vehicles assembled in the United States, Canada and Mexico. That’s up 14 percent from the same period of 2009, while the overall market rose 8 percent. That gives North American-built vehicles 76.7 percent of the marketplace, up 3.8 share points from a year earlier. A bit comes from better performance from the Detroit 3, especially Ford Motor Co. The Detroit 3 picked up 1.1 share points this year. But most of it comes from manufacturers based outside the United States producing a bigger share of their U.S. product line in North America. Sales of Japanese-built vehicles are down 2.6 share points to 11.9 percent, while Korean-built vehicles hold 4.9 percent of the market, down 1.2 points.